It makes so much sense that anyone getting married in an art museum should have an artist there to paint the occasion—especially when the artist has the same name as the acronym of the museum. The art museum in question was, of course, the Seattle Art Museum (SAM), and the specific venue was the Olympic Sculpture Park. The park sprawls over nine acres of waterfront in downtown Seattle, between Belltown and Myrtle Edwards Park, on Elliott Bay. Atop the highest elevation, the cornerstone and principal gateway of the park is the Paccar Pavilion, where the Roemer Davenport wedding was held. The event was celebrated under the watch of the statuesque installations of Roy Lichtenstein, Alexander Calder, Claus Oldenburg, Frank Stella, Louise Bourgois and others. 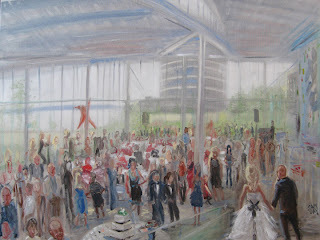 The families and friends of the bride and groom were as colorful and interesting as the art, and a pleasure to paint. The bride’s dress was like a cloud, in which a floor length black ribbon was continually getting lost. She matched the cake, a design as architectural as the building. There were considerable challenges in painting this mind-bending space. The architect designed it to open up to space, rather than recede into it. That’s an artsy way of saying the perspective is backwards. The corners of a room usually appear, to the natural eye, to taper towards an implicit vanishing point on the horizon. That is, the far end of the room looks narrower than the nearer part, and that’s how we unconsciously know its father away. The lines of the corners of a room are the first things I paint, because that perspective then helps establish where everything else in the painting is, in relation to each other. But in the Paccar Pavilion, looking north and west toward the gardens, Puget Sound, and the Olympic Mountains, the dimensions of the room get both broader and taller, so that the lines of one’s view expand to the sky. As I try to draw the room as a conventional square, it appears as if it has no corners. The bride and groom graciously gave me time to meet with them before their rehearsal, and we discussed and agreed on my vantage point. I was on the stairs, which they descended as they entered the room after the ceremony, as man and wife. It was the perfect view.